← The doctor will sea you now . . .
It’s no Quidditch, but I guess it will have to do. A single car races down Goyang City’s normally bustling main drag. The pedestrian walkways are barren. The only people on the sidewalk stand still with their eyes quietly fixated on the televisions in corner stores or pubs. It’s 10:00 pm and in businesses that have been closed for an hour employees are huddled around a miniature TV or a TV-enabled cell phone. Then, a cheer erupts from every apartment building, bar and corner store in Korea and the previously motionless observers are jumping up and down and screaming. The Red Devils have scored a goal. This is the World Cup in Korea. Seeking to both profit from and fuel the excitement, stores quickly filled up with Korean-themed T-shirts, tattoos, bandanas, and blinking devil horns for fans to wear while cheering on Korea. Big Bang, one of K-pop’s biggest brands, teamed up with Kim Yuna — AKA: Queen Yuna — to create The Shouts of Reds Part 2, an official cheering song with accompanying dance moves. It’s catchy, but the dance is surprisingly difficult to pull off without looking like an idiot. Not that I’ve tried . . .
Their eyes inevitably lit up when they heard that last part. “Oh! Very good, teacher!” They would say. Despite the enthusiasm, Koreans are not unrealistic in their expectations. When I asked students and co-workers if they planned to watch the next soccer game they always said yes. They would then tell me the stats and rankings of Korea’s opposition, and whether or not Korea was expected to win. So when Korea was slotted to play Uruguay for a knockout game on Saturday night, the atmosphere was enthusiastic, but perhaps not as electrifying as the first-round games. 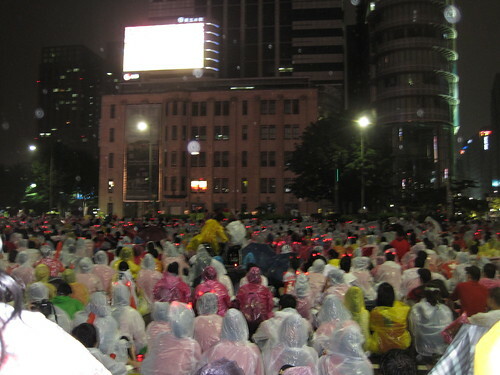 Nonetheless, I took a bus into Seoul and joined about 60 000 other people around City Hall to cheer in the rain. The video above is just a snippet of the cheering and yelling that was going on. I apologise for the Blair Witch camerawork. Clearly my future is not in documentary filmmaking. That is an extremely complicated and choreographed cheer/dance. Koreans must really love their soccer to learn that. 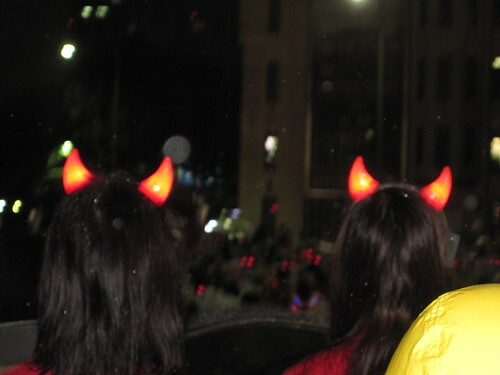 Did you wear horns? I was in England and was expecting them to be more excited then they were. It was probably because they were doing so poorly, but everyone was a bit down on the whole thing. Glad your experience was more positive.